If we had a penny for every time we were asked ‘how does Google stalk me online?’ and a pound for every time we were asked ‘...and how can we do it?’, we’d certainly have made a bob or two! We’ve all been there. You’re considering buying something online or enlisting a service and sure enough, all of a sudden your internet searches seem to be filled with ads encouraging you to buy that very product. Be it a dress, a bike, a luxury holiday, a cleaning service, you’re being reminded of what you were thinking about. So… How do I stalk my users online? This tactic of ‘stalking’ customers online is known as retargeting. It is an effective way to engage with people who have previously interacted with your website. There are many different ways that retargeting can be used, but a popular way is to use it to target people who have not converted on your website before. Think of the goal you want your users to complete, for example, purchasing an item from your site. The average abandoned cart rate is between 60% and 80%. That’s huge and is one of the biggest challenges for businesses online; if you are able to capture those who abandon their baskets, it could change your business. Retargeting your potential customers is an effective way to combat this challenge. It gives you the opportunity to remind your potential customers exactly who you are and why they should consider purchasing from you. If you’re a frequent user of the internet and various websites, you’ll be quite familiar with being asked to ‘accept cookies’ when visiting a website for the first time. Cookies are a way in which businesses can retarget you online. If you are considering using retargeting as a method, be sure to check your cookies policy and ensure that you are fully compliant. 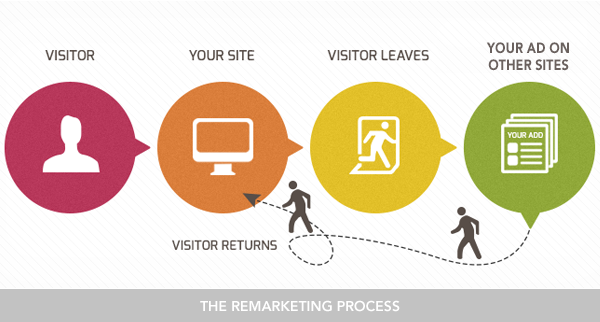 Once a visitor enters your site, a cookie is sent to their computer which then allows retargeting to begin. The user can be targeted across multiple platforms. By adding more specific code to a particular page on your site, you can refine the ads that your users will see even more. For example, if you are a family law firm who offers services on divorce, prenuptials and financial matters, you could ensure that people who have visited your prenuptial pages would see only prenuptial related ads. Retargeting itself can be managed through Pay Per Click platforms such as AdWords, Bing and also social media platforms like Facebook and Instagram. This can either be done by in-house marketing teams or an agency, like Ultimate, that has extensive experience in paid advertising and retargeting. Retargeting is part of a larger online marketing technique called remarketing. In essence this means using existing data you have collected to re-engage your potential customers with your brand. If you’re considering using this method in your digital marketing but not sure how to get it right, contact our digital marketing team today!